Super 8 Viral Update: Possible Craigslist Connection? After we got the new print out from Scariest Thing I Ever Saw website, people have been looking deeper into the photo itself to find more clues. After some digging, it looks like there may actually be a lead that involves Craiglist and possibly a new viral site. Get the details after the break. 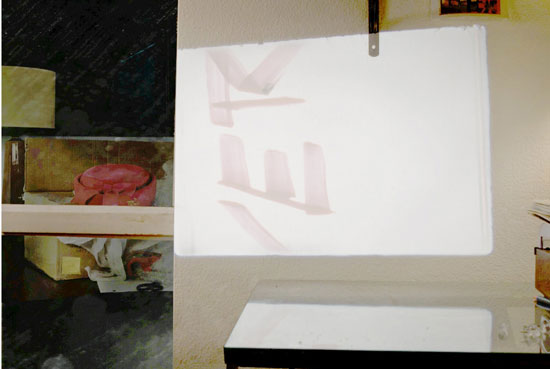 The picture in the print out (seen below cleaned up) shows a room with a projected image in the foreground that matches the lens video in the trailer. However, it’s the background of the photo that is more interesting. As we mentioned before, there are some random items in the back that look to be on sale. The zip code on one of the boxes is 25801, which is in the SouthWest region of West Virginia. Some of the guys at Unfiction decided to check out Craigslist to see if in fact those items were being sold. Sounds like a long shot right? While this could be passed off as just a coincidence, there are some clues that lead us somewhere. First of all, some of the pictures, there is a invitation on posted on the wall for some kind of memorial service or funeral, and the phone number is 708-2151. After some digging, 1-800-708-2151 leads us to information about a memorial service for a Evelyn Minker, whose son name is Josh. A Google search brings us a blog for a Josh Minker called Hookline and Minker. The guy is big on fish, with a knowledge for rare species, some of which are shown on the page and look quite frightening (maybe the Super 8 monster is a fish?). He had a personal issue come up in April, so this could be evidence it’s the same guy as the Craigslist poster. In fact, I’d bet that the partial date we see on the invitation is for April or May 16th, 2010. How else can try to figure out if this Josh is part of the Super 8 Viral? Well, there’s a Josh Minker apparently (I haven’t been able to confirm) registered on a UFO conspiracy forum. Also, the fact that none of the items listed on Craiglist have a price (they’re all “negotiable”) seems odd. Other than that, this could just be some poor fish lover we are bothering. To get all the latest and craziest speculation on “Josh”, check out Unfiction. We’ll keep you up to date on any of the viral news for Super 8, as well as any regular news given the film’s secrecy. Follow our coverage on the Super 8 Viral Page.